I hadn't planned to post today (I literally spent ALL day yesterday cleaning out my closet...not making it pretty, just organizing and getting it to where I could see the floor. Wish I was kidding! Still finishing it up today.) but I got a promo code in my e-mail last night and my wheels are spinning. 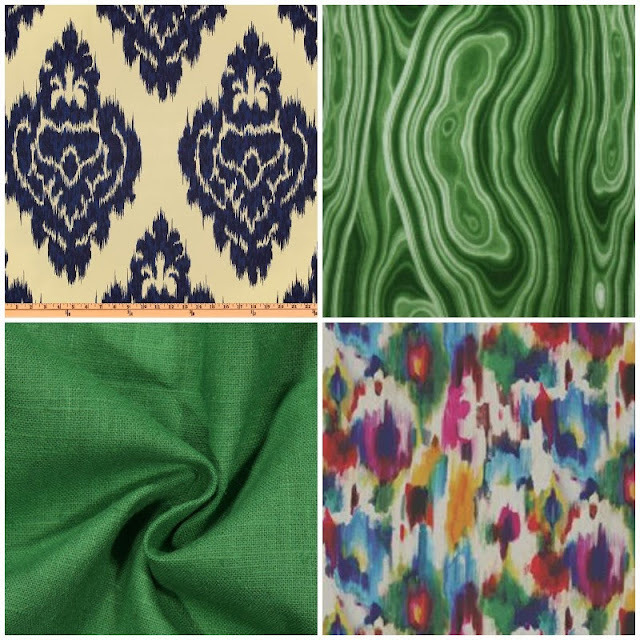 I haven't shared specific plans for the slowest-redo-ever which is my Master Bedroom, but I know what fabrics I want to use, with the exception of one that I'm trying to decide on. Which combo do you like? The one in question is the multi-floral in each collage which will be for pillows. They are both large scale..larger than they appear. 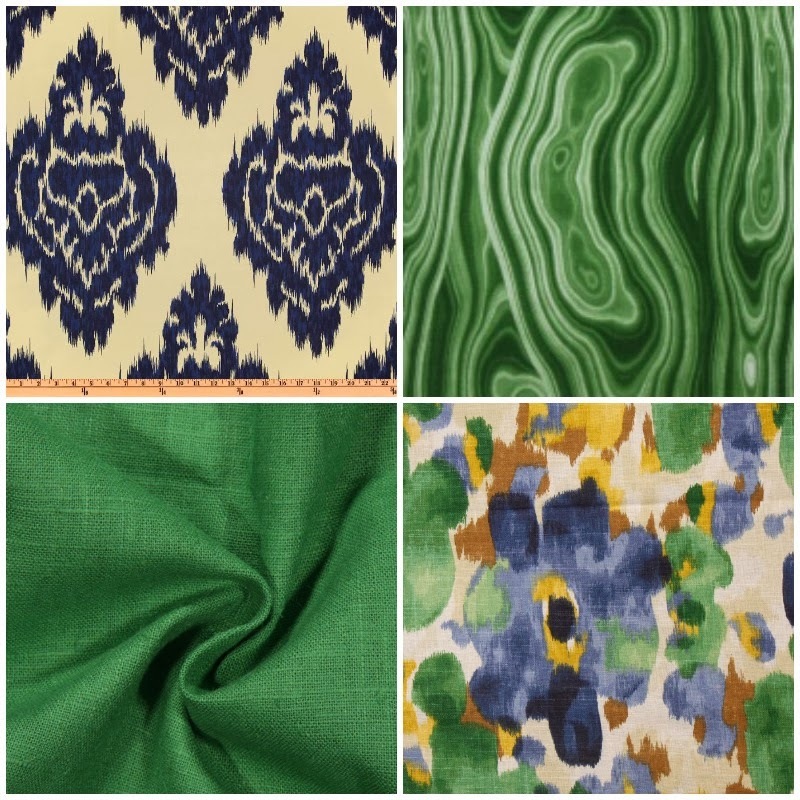 I'm drawn to the second one (Aurora Ikat-sadly from a different site and not on sale) mainly because I wanted to throw one more accent color in with the navy and kelly green, and with that one I can take my pick. I really like the first one as well (Robert Allen Landsmeer), just wish it had one more color in the mix...maybe some coral or red. I'm also open to throwing in another fabric or two as accents-maybe a little animal print and/or smaller scale geometric, but these will be the main ones. I want to take advantage of this great discount from one of my favorite online fabric stores and order in the next day or two. So, what's your opinion? Which mix do you like better? 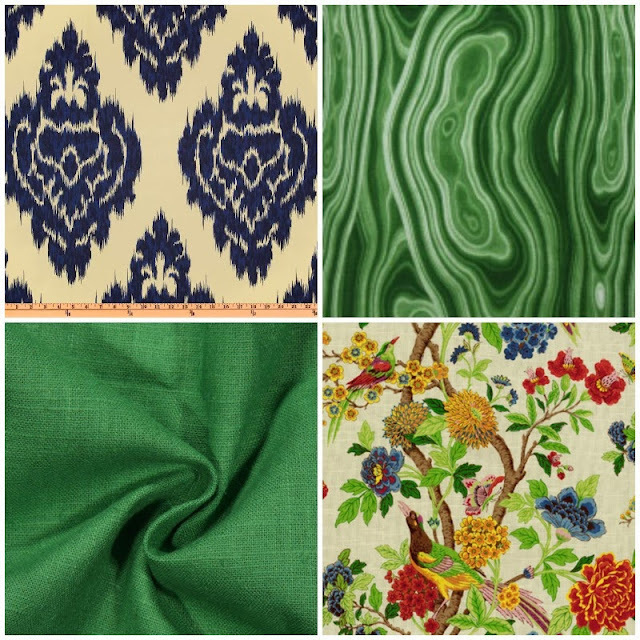 If you want to fabric shop too, Fabric Guru is offering 20% off through Monday, Nov. 18 with the code fall5. They have some great stuff! UPDATED: Abby's post popped up minutes after I posted mine, and look! I think we were totally thinking along the same lines. So, here's another choice, and I kinda really love it! Click to see how she incorporated this fabric into a fabulous bedroom inspiration board! Oh, and there's lots of other fantastic stuff there too that you'll want to check out. I think I like the second one better. I like the first one but I think the rusty color is throwing me off. Tough decision - I always have a hard time committing to fabric. For me the second. The first floral reminded me of littl old lady. The second just seems like you. Oh, the 3rd choice for sure! I think that #2 is great. Something about it keeps pulling me back. I like the combo of colors and what it adds to the navy and green. But really...they're all great! I like option #2 best too. It gives you a broader color spectrum to add fun pops of color! I do like all three though! I say go with the one you love the best and are drawn to the most, even if it's more expensive….get less of it and LOVE it!!!! You know how it is when you fall in love with a fabric, then settle!! i am going to go against the grain- i like the first the best! and i agree with lisa! I thought I liked 1 until you added 3 in the mix & I really like that one. Very classy & adds in more colors like you said you wanted!!! I think I prefer #2. 1 and 3 remind me of "Meemaw" fabrics of old. :) Of course, it's best to go with what you love! If the fabric is really expensive, use it as accents and not a larger project. Of course, I adore the navy and green...I have that in my bedroom. I so wish I would get myself in the closet and straighten it! You can't imagine how badly I need to do so. Instead, today I have sorted through paperwork, written "kindness" notes, and baked. #2!! Maybe because it is a lot like my bedroom now but I just love it so! Loving the 3rd option!! :) They are all great choices and I can't wait to see it all come together! I am cracking up because the Kalah Blue ikat fabric is what I have as my living room curtains & I made pillows out of the aurora ikat for my bedroom, lol. Those are two of my favorite fabrics! 3 is my top fave ... 1 is my second fave. Don't care for the floral in 2 at all. I vote for #2, but I love ikat, and would always put one in the mix. They're all gorgeous, and you have a great eye for mixing so I know whatever you choose will look great! I was going to say #1, that is until I saw #3, I love that one! NOt a fan of #2, but I am quite sure if you choose it it will turn out beautiful! Oh yes, I love 2 and 3. So pretty! The 3rd choice is beautiful! I like them all, tough choice! Thanks for sharing the fabric source, I've never heard of that site before but they have some great stuff for great prices! Number 3 is so you!!! Hmm...I think número tres. How's your Spanish? Lol. Yes # 3! I was drawn to # 2 at first but then with #3 you get more interest, a story and the same option for extra colors :) Goodluck! I really like #3 xo, Ron at Uptown Acorn.